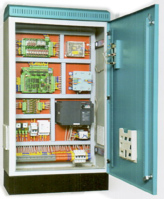 The following special features incorporated in our Controllers, make them silent, safe & reliable. Micro processor based ' PLC' for logic operating of the lift. 3 VF Controls. for high speed and perfect leveling. Compact, elegant and space saving. Rate of breakdowns in the control panel can be reduced instantly, by a simple method of replacing the faulty electronic printed circuit card. With control voltage at a mere 12 volts DC, the system is safe.